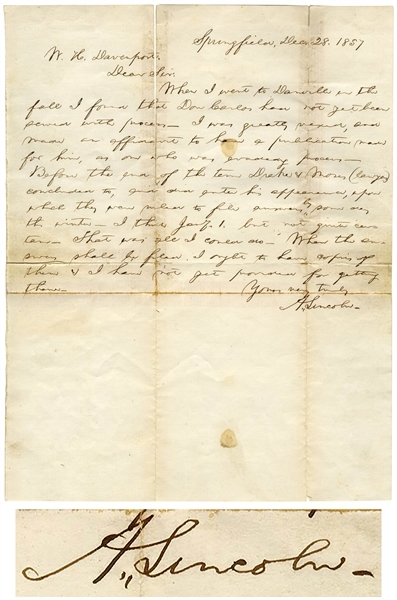 Abraham Lincoln autograph letter signed, datelined Springfield (Illinois) on 28 December 1857. 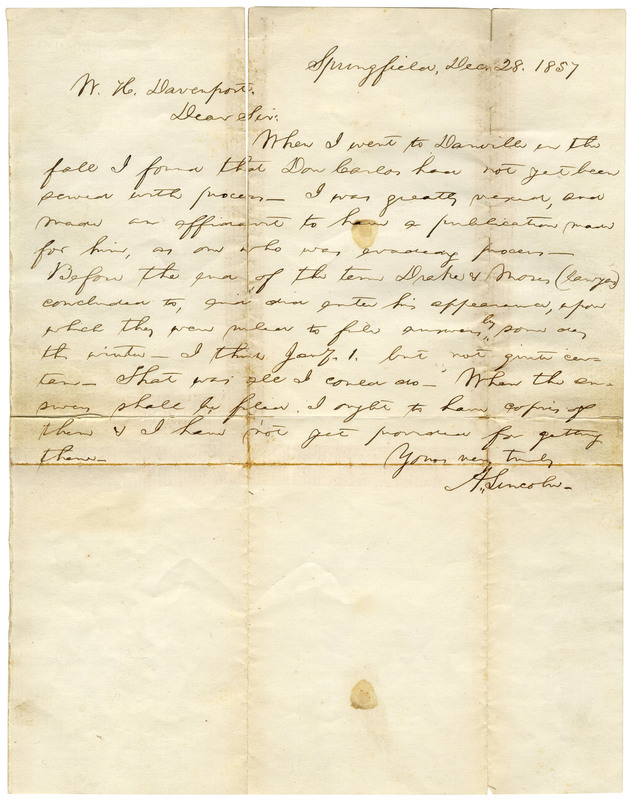 As a 48-year old lawyer, Lincoln writes to his client William H. Davenport, the plaintiff in ''Davenport v. Sconce and Don Carlos'', a case involving fraud and collusion at the General Land Office in Danville, Illinois. Lincoln writes in full, ''W.H. Davenport / Dear Sir: / When I went to Danville in the fall I found that [defendant, Land Agent] Don Carlos had not yet been served with process. I was greatly vexed, and made an affidavit to have a publication made for him, as one who was evading process - Before the end of the term Drake & Moses (lawyers) concluded to, and did enter his appearance, upon which they were ruled to file answers by some day this winter - I think Jany. 1, but not quite certain - That was all I could do - When the answers shall be filed, I ought to have copies of them & I have not yet provided for getting them - / Yours very truly / A. Lincoln.'' Lincoln would ultimately prevail for his client shortly before being elected President in November 1860. 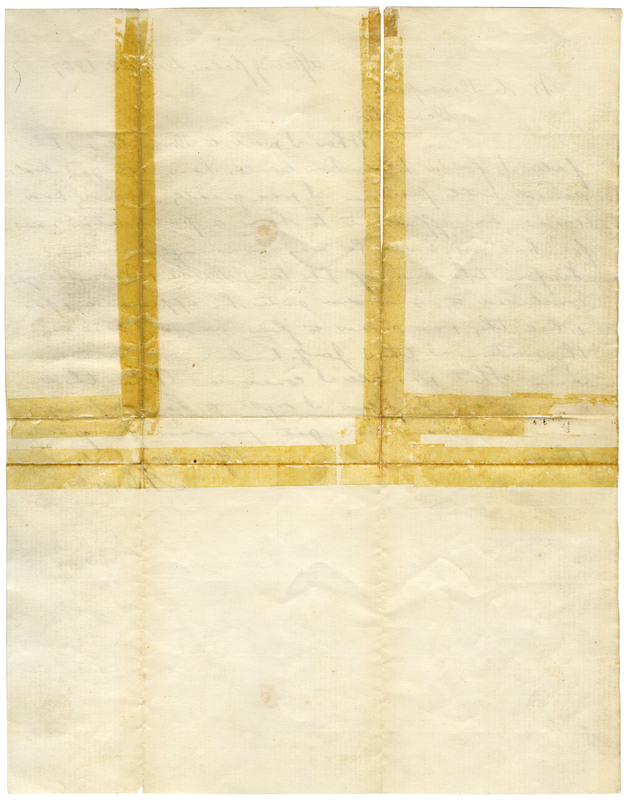 Letter measures 7.75'' x 9.75'' on laid paper with ''Windsor Mills'' watermark. Partial separation along folds, repaired with tape to verso. A few spots of discoloration, overall in very good condition. 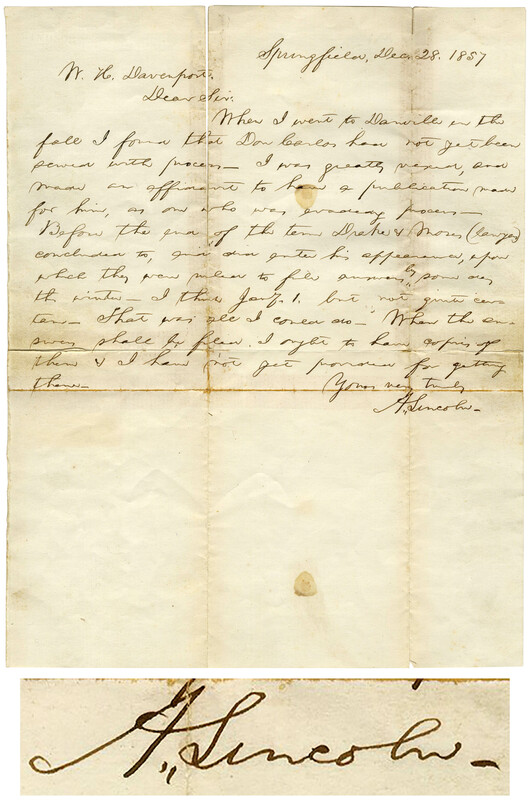 Letter is published in ''The Collected Works of Abraham Lincoln'', edited by Roy Basler and published in 1953.